Just before the 4th of July weekend, I took a drive up to Upper Blue Lake. If you'll remember, I could only get up the road about 20 miles and then the road was closed. The Local Highway Patrol Officer said that even the Forest Service couldn't get up there. So Yuki and I left the house about 8:30 yesterday morning with the goal of Upper Blue Lake. On the way, we stopped at Woods Lake because Yuki had heard about it, but has never been there. There were a bunch of people fishing right at the outlet of the lake where Woods Creek starts. Seveal catching small Brookies. Yuki would have been fine fishing there, but I drug him kicking and screaming back into the truck. I was going to fish Upper Blue Lake, period. The road was clear, the water was Coooold, and it was sunshine, blue skies, and about 66 degrees. By the recent temperature standards, it was AWESOME. I even managed some slightly sunburned arms. Yuki managed one small Rainbow about 9", I managed two Cutts and one small Rainbow. It was not the usual Upper Blue Lake fishing so we hung out until a little after Noon and headed back down to the West Fork of the Carson to do a little fly fishing. For some reason the four pictures I took have disappeared so all the photo's are courtesy of Yuki (My official blog photographer. Unpaid of course). So here I am on the West Fork of the Carson River. Yuki was fishing a Sloan's Paralyzer so I decided to throw an orange Stimulator. Just to give the little (5 or 6 inch) trout something to play with. As usual there were a lot of hits, but due to a couple slow, old, Geezers no catches. Well, that isn't exactly true. I did manage to hook up one little brown (lost photo), but that was it. Just a lot of fun playing with them. Then when we got down to the Paraplegic fishing area, our fishing was halted by the wedding party. Seems the couple was getting married in less than an hour and wanted to get the wedding photos along the river. Well, that was it. We packed up and headed home about 3:00 or so. From a nice 60+ degrees to 99 when we hit the house. Once again we went to Hendy Woods State Park for our July camping trip. Before the year began we bought something called a Flame Genie. It's like an outdoor campfire, but contained in a "can" if you will. On our April trip to Half Moon Bay State Beach, it was just too windy to use it. Our May (to Lassen Volcanic National Park) trip got cancelled because of the death of Katherine's Ex and she wanted to be home in case her daughter needed her. 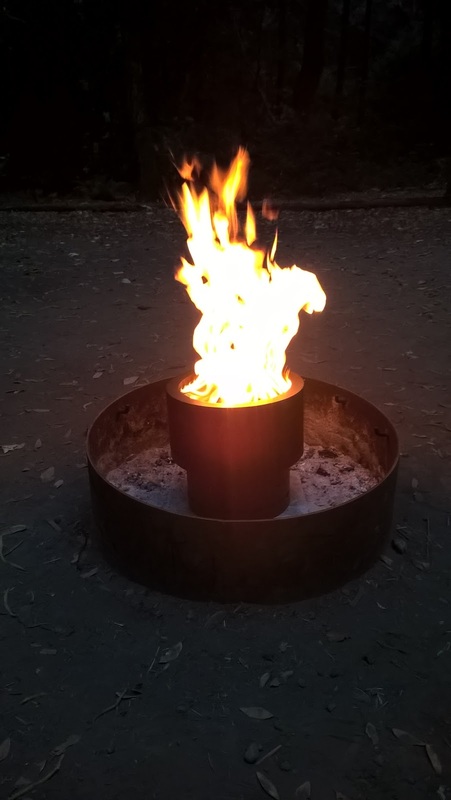 Our June trip was to Calaveras Big Trees State Park (remember the bear), but it was just too hot for a fire. But this time, the temperature dropped down enough for a fire on Thursday and Friday nights, here it is. A little explanation is probably in order. You see, the Flame Genie burns wood pellets like a pellet stove you'd put in your house. You have to put something in to start them and we use two things. One is a "half ball" of sawdust igniter and the other is the like a Duraflame log cut into little bitty pieces. Place 4 of the sawdust balls on the screen, add 8 or 10 small pieces of the Duraflame pieces, and cover them with about 2" of pellets. It takes about 10 minutes to get it roaring, but once there, all you have to do is sprinkle some more pellets to keep it going. We burned one bag of pellets for the weekend (about $5) compared to buying firewood at the park (they only allow wood from the local area because of bugs and whatnot) at $7 a night. A good deal any way you look at it. We decided we should put something hard under the Flame Genie to keep it level and the only thing we could come up with is one of the "sample" squares of ceramic tile from when the kitchen floor was replaced during the kitchen demolition a couple years ago. You remember. The tile lasted 20 minutes until the heat cracked it. It did make a nice tree shaped piece in the middle. Couldn't have cut it any better my own self. We did try a new space this year since we also had a new trailer. The space couldn't have been better. Facing the way the picture is, on the right was a huge, probably 5 foot high tree laying on the ground that blocked out the people next to us and on the left there wasn't anybody for probably 100 yards. It was awesome. Could have put a half dozen tents to the left of the trailer and still had plenty of room. Next time up, same space. Drive up on Thursday, wine tasting on Friday, out to dinner for our anniversary on Saturday, home on Sunday. Now let me tell you about the driving. Whining time here. The trip up was a little over 5 hours, but it was a long way. Google Maps says it's 214 miles and should take 4 hours and 4 minutes. I guess they don't take into account traffic and road construction. Highway 80 toward San Francisco wasn't bad. I've told you about the horrors of Highway 37 around San Pablo Bay. It hasn't changed and Highway 101, the worst road I've been on since I quit four-wheeling. Only thing I can say is that it's probably a good thing I have four wheel drive. Could have used it in a couple places. That was the trip up. The trip back, just as bad except with more traffic, 6 1/2 hours to get home. Yesterday, nothing but recovery. I think we might skip this trip next year and go someplace else. Got a lot on my plate this week so if I manage a fishing trip, it will be a "spur of the moment" grab my gear and jam.